Trips to the mountains always come hand in hand with a magical atmosphere. Many people prefer active rest and this type of hike over the lying on the sunny beach. No wonder. Beautiful nature, no civilization buzz, incredible views and improvement of health. These are powerful arguments. If the description above also reflects your personality, you will like this article. 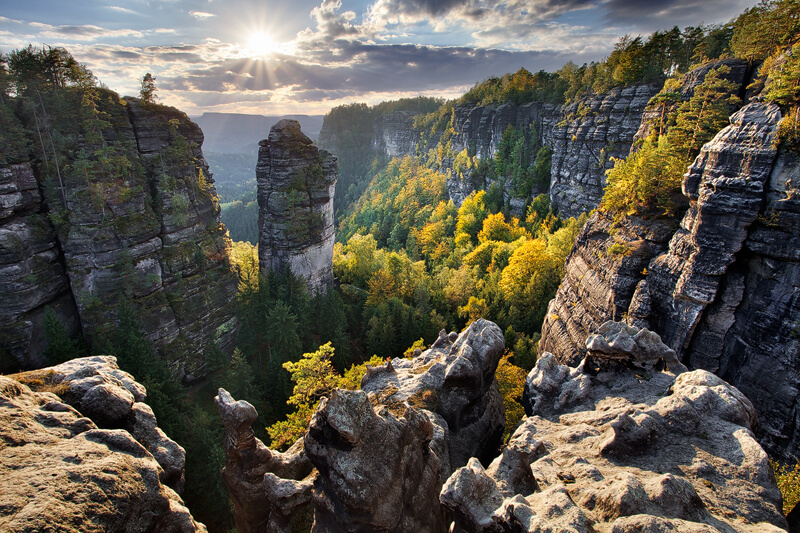 Today we focus on mountains in the proximity to the city of Prague. Do you have great stamina, steady shoes and a lot of motivation? If your answer was at least once “yes”, do not look any further – we will take care of your leisure time in the next days. In the beginning, it’s good to say that mountains in the Czech Republic may not be as high as you are used to. The truth is the highest peak in the country is 1603 meters high and area around Prague is mostly flat. Although, a few hours of drive take you to the beautiful nature worth putting your hiking shoes on and explore. This highest mountain in the Czech Republic is considered to be one of the most famous mountain resorts. From Prague, the distance is about 150 kilometers, approximately two hours driving by car. Plenty of beautiful spots to visit there, so one is not sure which one to start with. We have to mention Sněžka, the highest Czech hill (1603 meters above the sea level). Well visible even from the long distance and is also very easy reachable for the wanderers. For the admirers of magnificent view, we recommend mountain gorge of Modré sedlo (Blue saddleback) The access is by normal road, so easy to reach also by the cyclists. With Czech people more known by abbreviation “Špindl“ (from Prague it is about 2 hours drive). Famous for its ski area, great for all the skiers and snowboarders. We recommend also visiting the dam called Labská priehrada, aged more than 100 years and still protecting the surrounding villages from the floods. When talking about the Labe River, close to the “Špindl,“ there is located the source of the river Labe, the biggest river of our neighbors. The well forth is close to the Polish borders and is also considered to be one of the most popular tourist destinations. It is the most northern mountain range in Bohemia, part of it is located in Poland which you can reach in 90 minutes driving from Prague. 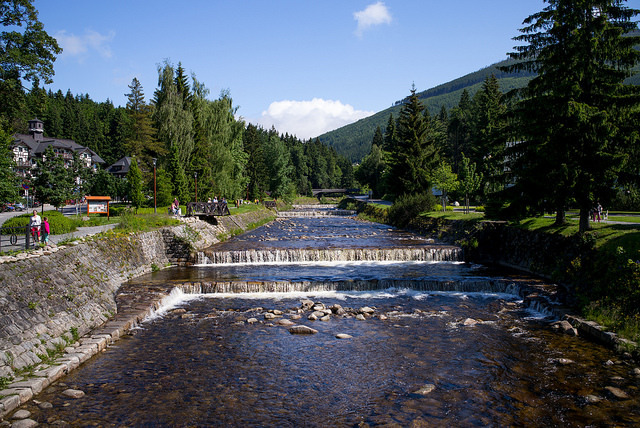 If you stroll through the local forests, you will certainly enjoy the view of several cascading waterfalls on the Černá Desná River. Who would like to enjoy the stunning view, let’s get to the highest point of the Czech side – hill of Smrk. Do you like skiing? Then visit Ski resort of Bedřichov and stay in one of the picturesque tourist chalets and cottages. Less than one kilometer from the village there is more than a century old Královka lookout tower. It is located almost 860 meters above sea level and when reaching this point, be sure to have your camera ready. Once there, you get why. This impressive mountain with volcanic origin is located approx 80 km from Prague, with the square area of more than 1000 square kilometers. By car, count with about one hour of drive. Our neighbors have classified the whole surrounding area of this mountain as a protected landscape area. 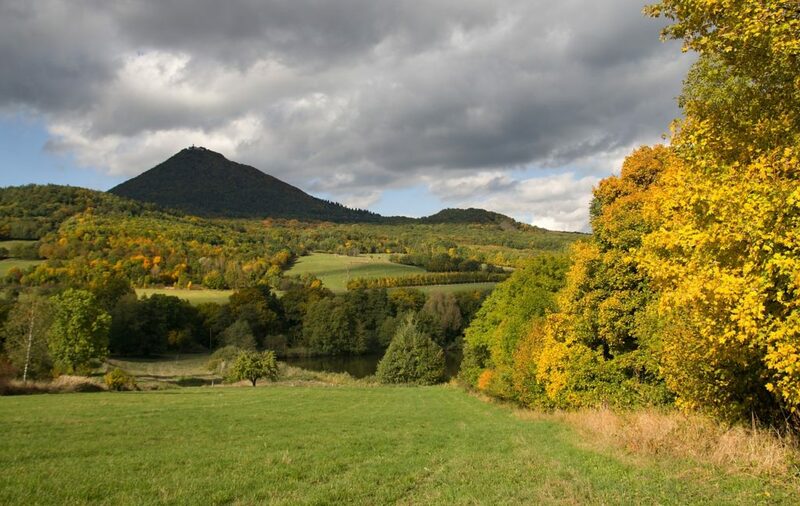 Dominant of Central Bohemian Uplands is, of course, its highest peak – hill of Milešovka (837 meters above the sea level). When visiting this area, you should never miss this place. At the highest point of the hill, there is located a meteorological station, dated since 1903 when it was built. 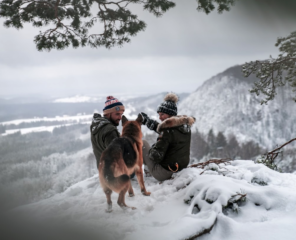 When planning a trip here, be always careful about the weather condition as Milešovka belongs to the windiest places in the country and weather has a powerful impact on this. The view is definitely worth the patience. There are another three hills in uplands that you can try to hike. Lipská hora, Lovoš and Sedlo offer stunning views as well. You can reach their tops by hiking trails, or human-made paths. History lovers will be satisfied as well. Bohemian uplands have a lot of various castles, chateaus, and ruins. Let us mention at least Skalka ruin, fairy tale castle of Kostomlaty, dated to the first half of 14th century, or beautiful chateau of Vrbičany in baroque style. 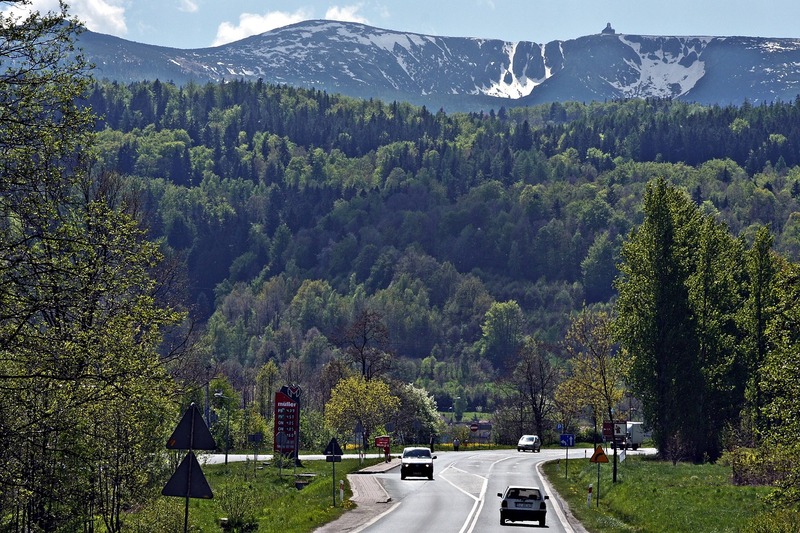 Breathtaking forested highlands – that is Czech mountain named Brdy. In the past, in this area there was located army training area, that you cannot find anymore nowadays, it was replaced by a protected landscape area. Shortly after its beginning of existence, it was not entirely open for the public, as the location was still full of leftovers of active munition. Currently are all the sites available to access and marked by touristic signs. Very attractive for visitors is the meteorological tower of Brdy, located on the second biggest hill of the mountain – Praha (862 meters above the sea level). From its observation point, you can see areas of Krušovice and Šumava. Brdy – it is the perfect place to get to know a wild nature, whether from the bike saddle or on foot. The charming place to visit is also Padrťské rybníky (Ponds of Padrť) that is considered to be the biggest water surface in the region. 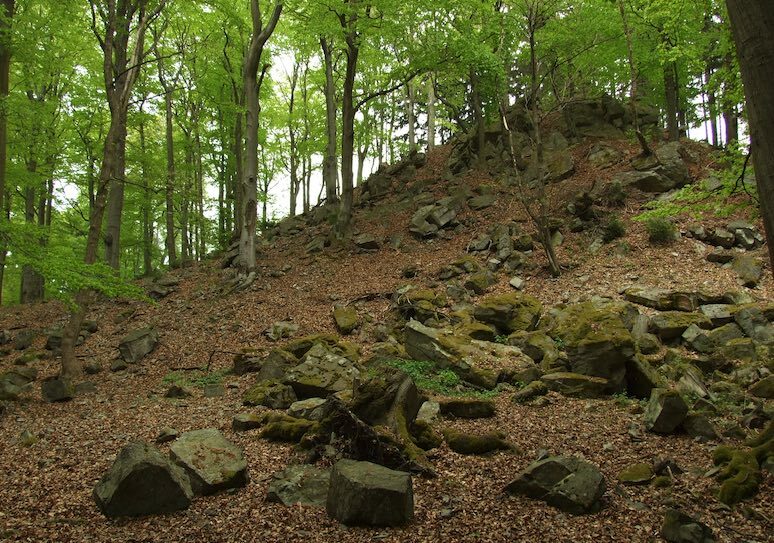 If you are not scared of ghosts, you should also visit Fabiánovo lože, the shape made of rocks close to the hill of Velká Baba. The legend says that it is haunted by poltergeist Fabian, who used to be the powerful owner of Brdy in the past. This mountain is sometimes geographically and also geologically put under Brdy mountains, but also as separate mountains because it has a lot to offer. The highest hill is Písek (691 meters above the sea level), where is also airborne radar located. 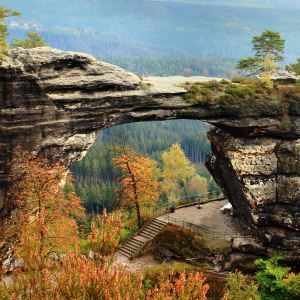 The very famous locality with tourists is well known as Černolické skály (Černolické rocks), that serves as a temporary training area for many rock climbers (as per written notes since 1905). It is a natural monument with a stunning view over the surrounding area. The area with the very poetical name – Andělské schody (Angel’s staircase) hides the beautiful world of flora. The area got its name due to typical undulated terrain. The botanics lovers can find here many protected and rare species of plants. Who wouldn’t like to visit the mountains with such poetical name? 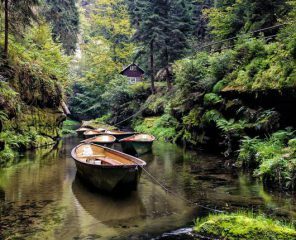 Bohemian Switzerland is a magnificent area, for clear reason classified as one of the four National Parks in the country. 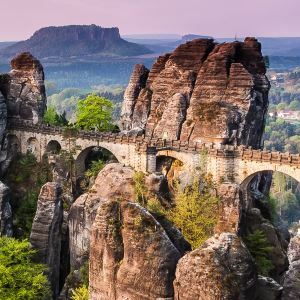 It is located west of Prague, at the German border, but the trip itself is worth it due to numerous reasons. Number one is beautiful nature and landscape, rich on flora and fauna. Typical for this landscape area are several rocky hills, massives, and formations that embellish the relief in their unique way. The highest point of the national park is Růžovský vrch (Hill Růžovský), with its 619 meters above the sea level that is part of the same natural preserve. It is the place for all the keen enthusiasts to observe the incredible diversity of many species of animals and plants or mushroom. 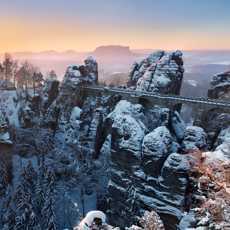 Two iconic symbols of Bohemian Switzerland are Bastei Bridge and Pravčická brána (Pravčická Gate). The natural rock formation is considered to be one of the most beautiful dominants in the whole country. 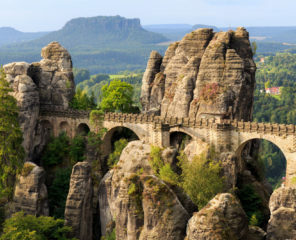 This sandstone massif forms a picturesque arch, under which is located beautiful castle of Sokolí hnízdo (Eagle’s nest). A night spent at this place will be one of the top experiences of those who did it. Nearby the rocky gate is located the adventurous area of Mezní louka, that is the perfect place for trips for families with children. This settlement is considered to be the crossroad of various cycling and hiking paths. A unique experience is also wherry sailing through Edmund (or Wild) gorge. Sailing between majestic rocky forms provides incredible atmosphere. The proof is also longterm popularity with locals and tourists; gorges were open to the public at the end of 19th century. 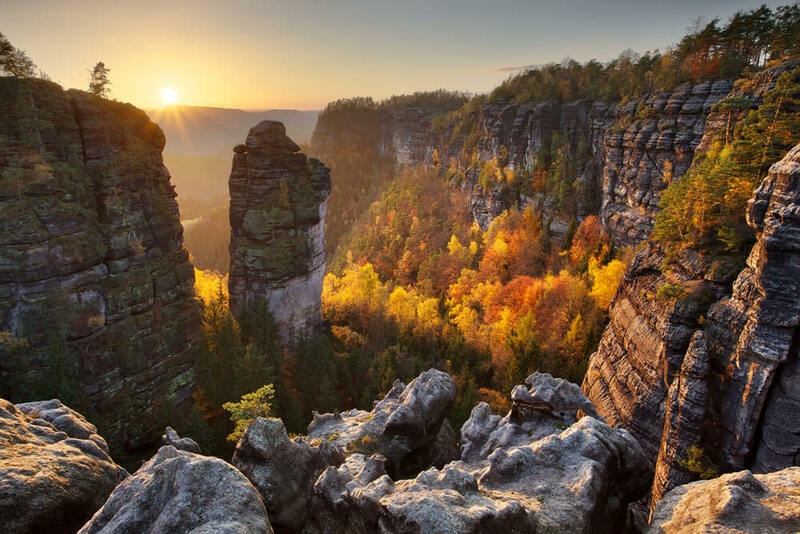 Would you like to experience Bohemian Switzerland? Let us help you to plan your trip and show you the most beautiful places in this national park.